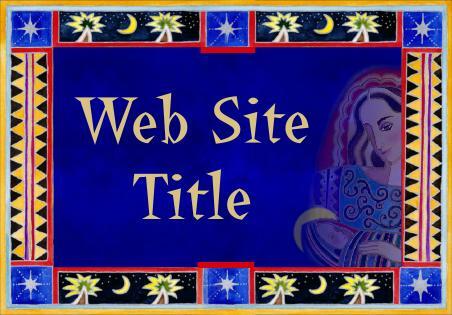 This is a Christian themed coordinated web set I created based on the Madonna and child theme associated with Christmas. The story of Christmas is based on the biblical accounts given in the Gospel of Matthew and the Gospel of Luke. According to these accounts, Jesus was born to the Virgin Mary, assisted by her husband Joseph, in the city of Bethlehem. Above you see a sample of how a web page title could be inserted into the Christmas title image created for this set. A blank of the title clip art is in the .zip file below. If you don't have a graphic program capable of inserting a page title, e-mail me and I will do it for you as time allows. Below you will find the Christmas star graphic divider and bullet designed for this page. Christmas coordinating navigation graphics that could be placed at the bottom of each page if appropriate are also included. Christmas festivities often combine the commemoration of Jesus' birth with various customs, many of which have been influenced by earlier winter festivals. Traditions include the display of Nativity scenes, Holly and Christmas trees, the exchange of gifts and cards, and the arrival of Father Christmas (Santa Claus) on Christmas Eve or Christmas morning. Popular Christmas themes include the promotion of goodwill, compassion and peace. In most places around the world, Christmas Day is celebrated on December 25. It is preceded by Christmas Eve on December 24, and in some countries is followed by Boxing Day on December 26. The Armenian Apostolic Church observes Christmas on January 6, while certain old rite or old style Eastern Orthodox Churches celebrate Christmas on January 7, the date on the Gregorian calendar which corresponds to 25 December on the Julian Calendar. The date as a birthdate for Jesus is merely traditional, and is not widely considered to be his actual date of birth. The Nativity refers to the birth of Jesus. Remembering or re-creating the Nativity is a central way that Christians celebrate Christmas. The Eastern Orthodox Church practices the Nativity Fast in anticipation of the birth of Jesus, while much of the Western Church celebrates Advent. In some Christian churches, children perform plays re-telling the events of the Nativity, or sing carols that reference the event. Some Christians also display a small re-creation of the Nativity, known as a Nativity scene, in their homes, using figurines to portray the key characters of the event. Live Nativity scenes are also performed, using actors and live animals to portray the event with more realism. During the Reformation, Protestants condemned Christmas celebration as "trappings of popery" and the "rags of the Beast". The Catholic Church responded by promoting the festival in an even more religiously oriented form. Following the Parliamentary victory over King Charles I during the English Civil War, England's Puritan rulers banned Christmas, in 1647. Pro-Christmas rioting broke out in several cities, and for several weeks Canterbury was controlled by the rioters, who decorated doorways with holly and shouted royalist slogans. Font used for the sample title and buttons above is called: "La Bamba LET"
To save, you may download the .zip file which includes the Christian Christmas graphics, clip art, instructions and HTML template. Do not link to the graphics on this page! Please note that this set is free to use on personal websites only (donations are always appreciated). Those sites that hope to generate income (business site) there is a one time $10 minimum requested donation payable through Pay Pal. Christian Christmas holiday web theme set courtesy of Crystal Cloud Graphics.